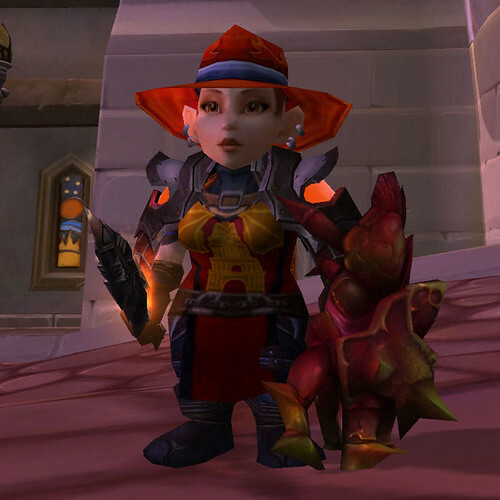 There’s always been a bit of fashion stuff in World of Warcraft; certain items of clothing or other gear that you could buy or get that were valuable not because of their stats, but because they looked cool (or unusual, or weird, or extra-ugly). The Blizzard folks did put some thought into gear design, and there are various sets that go together thematically at both high and low levels. 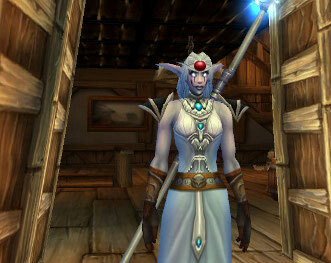 But even at that if you’re a holy priest or a warlock or a retribution paladin or whatever at a certain level, there are a very limited number of things that are Best In Slot (BiS) for you at that level, and at most a couple of different integrated outfits, and even those will have been designed by, well, by Blizzard. And they ain’t exactly fashion designers. But now that is all changed! 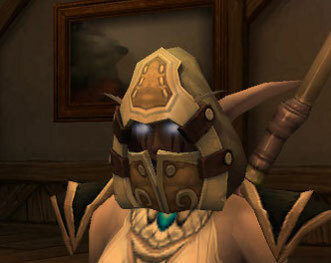 Using Transmogrification, you can make any piece of gear look like any other piece of the same sort of gear (with various complicated rules like you have to own and be able to use both, both must actually have some kind of stats bonus, etc, etc), and that has completely opened up the WoW fashion scene, both in town and in the fray. 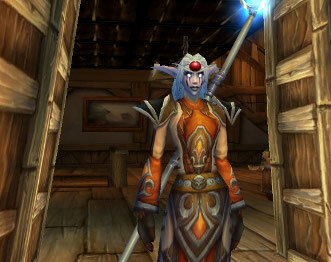 For instance I hadn’t taken pictures to speak of of Spennatrix, my healer Priest, or even played her all that much lately, at least partly because she looked stupid in her gear. I mean, yuck! And also, eek! Is that a look you’d want to trust your life to in battle? More like something you’d expect to be battling against. Again, omg and/or wtf rofls. Blizzard’s style choices at high levels have always run to more or less elaborate more or less dark and threatening things, which is fine if you’re a necromancer warlock or a mage or even warrior or whatever, but Spennatrix is a humble Priestess of Elune, the WoW Moon Goddess, and is not really interested in looking like any of those things, thank you very much. Now there’s someone you want at your back when you’re tanking Mannoroth at the Well of Eternity, eh? And back in SL, boy Dale has a rather new look, too! We’ll see how long that lasts. Fortunately, no annoying raids or prolonged quests or tedious grinding are required to change looks in SL; just shopping!